Two recently released and hugely popular movies - A Star is Born and Bohemian Rhapsody - will headline Cinema at the 'G, presented by Bank of Melbourne this summer, as the iconic MCG once again transforms into the city's most spectacular open air cinema. Now in its fourth year, attendees will be able to sit back and relax on the hallowed MCG turf on February 1 and 2 as a movie lights up the giant scoreboard screen. Opening night will feature American musical romantic drama film A Star is Born, starring Bradley Cooper and Lady Gaga, while Bohemian Rhapsody, a biographical film about British rock band, Queen, will screen the following evening. "There's nothing more Melbourne than heading to the 'G with a group of friends and family, and we're thrilled to be able to once again transform the stadium for a very different summer spectator experience," said Melbourne Cricket Club CEO, Stuart Fox. 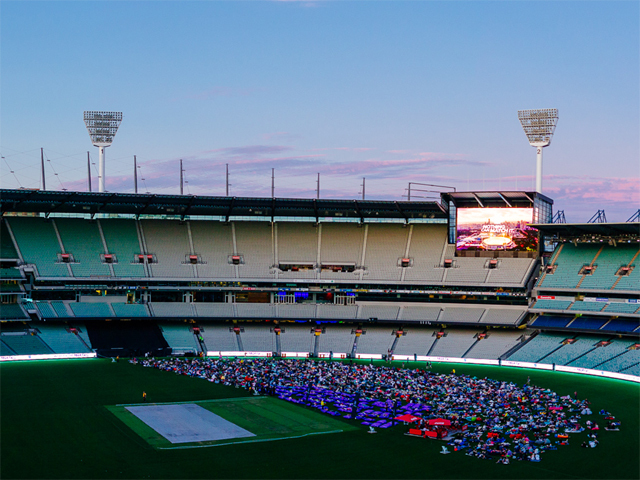 Bank of Melbourne chief executive Michelle Winzer said, "Sitting on the grass at the 'G to watch a blockbuster on the big screen has become a Melbourne summer tradition. "We're pleased to present this unique experience for another year, with all proceeds going to the Bank of Melbourne Foundation. The contributions help us support charities making a difference to Victorians who need a helping hand." Each session is capped at 2000 attendees, with a limited number of VIP tickets available each night. Tickets are now on sale. For more information, please visit mcg.org.au/cinema. Proceeds from the event will go to the Bank of Melbourne Foundation, which has supported more than 100 small charities with almost $3 million in funding since 2013. Charities can apply for grants of up to $50,000 in the current funding round at http://info.bankofmelbourne.com.au/foundation.